J. Scott Coatsworth has a new MM Sci Fi book out and has come here today to tell us lies. Yeah, I know. Boasting about being paid for them too. Whatever is the world coming to? Here was I thinking that on Valentine’s Day I should be posting gifs of sparkly pink hearts, and instead I’m facilitating a friend tell porky pies. Just as well he’s so good at them! So this is a bit of a monster post. 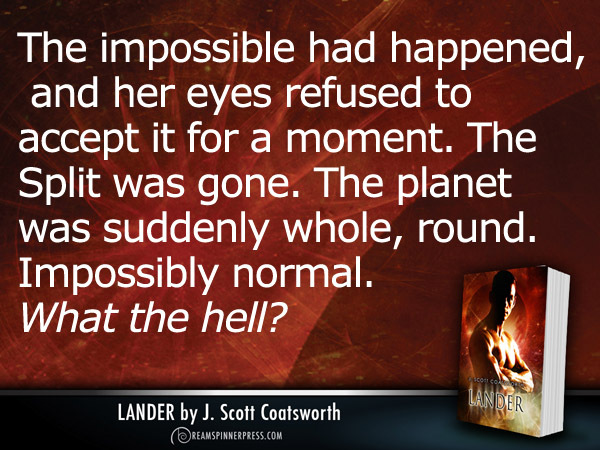 I’ve got Scott being mendacious, a load of info about the book, a competition, an excerpt and a review of Lander by yours truly. Now that calls for a menu here that will allow you to skip merrily about this post to read it in whatever order you like. Or, you know, for you to ignore and just read on. Your choice! I have one of the best jobs in the world. I get paid to tell lies. More specifically, I get royalties to tell stories of places that never were, except in my own fevered imagination. It’s a gig I always wanted to have, since I got hooked on the lies of J.R.R. Tolkien and Anne McCaffrey. These authors wrote fully-realized worlds that sucked me in, that made me wanted to be there, to have a fire lizard on my arm and a dangerous ring on my finger. You see, we authors live in this weird place. When our eyes are open, we’re in the real world with all y’all. But when we close them, we fall into somewhere else – a world where the rules of regular life are suspended and a world of possibilities opens up. So I pull out little bits and pieces of things that aren’t true and weave them together into something that feels right. So yeah, I’m a paid liar, but sometimes those lies, if I do my job, feel true. Xander is a skythane man whose wings have always been a liability on the lander-dominated half world of Oberon. Jameson is a lander who has been sent to Oberon to find out why the supply of the psycho-amoratic drug pith has dropped off. The Oberon Cycle books (Skythane and, now, Lander) are an odd but fascinating mix of sci-fi and fantasy. I’ll admit that I personally find that a little harder to get into – am I reading hard tech-in-space or ancient gods and prophecies? Threading my way between the two takes a little more effort. Not that that’s a bad thing, but the merger of two can be challenging. I’m also a touch ambivalent about winged humans because the mechanics of that are rarely truly examined. They’d all have to have ginormously enlarged chests, like a bird’s, to have sufficient musculature to fly, I think, and hollow bones to reduce mass and weight–something that’s a bit glossed over in wing-fic! All that said, I did find this a fascinating premise. A world split in two parts known as Oberon and Titania, with each half occupying a different dimension. Only a few can cross the boundary. This is a world where some humans, the Skythane, have been genetically altered to grow wings (how? Who did it? ), and where two men are fated to unite to two main Skythane nations and reunite the long-sundered halves of the world. So far, so fantasy. But the reason for that world spilt? An incomplete attempt to save it from destructive solar flares, caused by an interstellar war, by moving it into a parallel universe. People get to it on spaceships and shuttles. But when you get there, there are nimfeaches, (a sort of ghostly alien butterfly) and fetches, prophecies and destined fates. The main antagonist here is a commercial company, OverCorp, exploiting the world to mine a drug called pith. So then you’re back in a dirty underworld of criminals and hard men (and women! ), ruling a kind of Bladerunner world where people are linked electronically into a worldnet through implants. You can see why my head was spinning a bit. To keep all this stuff straight and working, you need good worldbuilding. This is something Scott Coatsworth does so very, very well. The competing fantasy/tech threads are woven very cleverly into a consistent picture. That’s hard enough to do in either sci-fi or fantasy. Combining the two? Scott gets major kudos for his achievement here and a bow from yours truly, because worldbuilding is my **jam**. Love it when it’s done well. 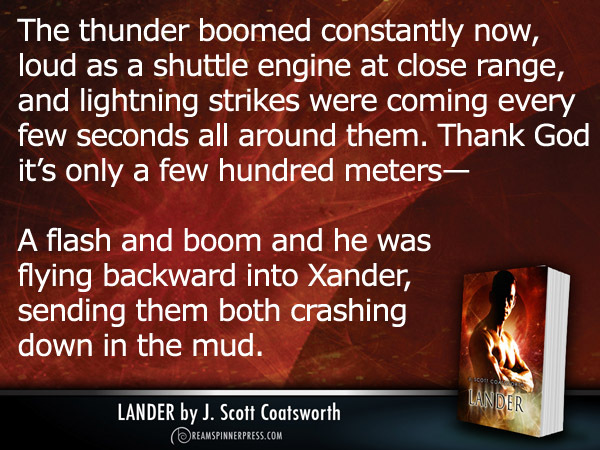 The two MCs – Xander and Jameson are the lost princes returning to their realms to reunite the two halves of the world. They do that. And then there are consequences. Real, horrid consequences. So kudos for that too. Actions have to have reactions, and the outcomes are often chaotic. The personal consequence for these two revolves around the one thing I disliked in the first book where one character is fundamentally and irreversibly changed without his consent by the actions of another. That consent issue bugged me then, and comes around to bug both MCs now, leaving them unsure if their mutual attraction is even real. The person who instigated the change, though, is still… well, unpunished, for want of a better term. She feels a bit of guilt, but rationalises everything away in the name of expediency. That, Scott my boy, is still bugging me. All in all, I enjoyed this. It builds neatly on Skythane and sets the scene beautifully for the third book, Ithani (to come). And while in some senses it’s a transitional book, there are enough plot and character resolutions to be a very satisfying read. Next Space to Read… Mmmmn, Heaven.